PSBA volunteers offer information at booths for all sorts of situations. Traditionally we’ll have a booth at Seattle Tilth’s Harvest Festival, West Seattle Summer Fest, Shoreline Solar Fest and other gatherings. We go to classrooms and libraries and schools and churches, usually with an observation hive of honey bees, always with a beekeeper’s zeal to talk about pesticides and resource plantings and stewardship for all pollinators. 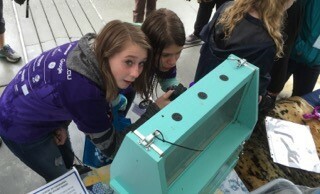 Earlier this year PSBA was asked to run a booth at an October UW-Bothell STEM event for 5th through 8th grade girls. I volunteered to organize and run the booth. And promptly forgot until reminded a month ago. By this time the event attendance estimates had grown to 700 young women. So how is it possible to reach even half that amount with a honey bee related science/technology/engineering/math activity? I couldn’t think of simple, time effective, visually exciting experiments that would work. I knew we would have access to electricity, but we were going to be outside. I did not want to risk the association’s good microscope to throw images up on a laptop. Nosema spores are kind of boring except for the gut pulls, and the sounds from the observation hive were not anything related to swarm pitch changes. How exciting was it to watch the green frequency line jiggle on my new “FreequenSee” App? Not very exciting. 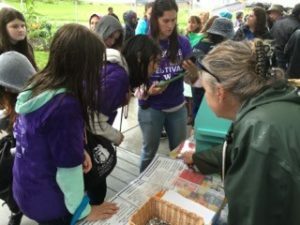 Fortunately I was able to connect with one of the young women who helped design and build the extractor for the Edmonds Community College beekeeping group. ‘J’ is now a Junior at UW Bothell, majoring in Electrical Engineering. We displayed a large poster ‘J’ had made of the group’s design process. Hopefully she and her cohorts will bring the extractor they designed, using 3-d printing amongst other materials, to the PSBA January Science Fair for everyone to see. Finally, I decided to use buttons and three different samples of types of honey to draw in the crowds. Using the Arizona State education website and various 4H publications, I put together two different fact cards about bees and honey and Africanized honey bees. The object was to find the information that would help solve a few math problems. The math should take no longer than a minute and a half, with paper and pencil and long division. Then a minute and a half for discussing honey and crystallization. If we could fit four people across the table with paper and pencils, and run a group through every 3 minutes, and the event lasted five hours… we would have reached 400 people! In front of the table, PSBA volunteer Elaina Jorgenson showed videos of Queens piping and then continually surprised people with her Bluetooth speaker suddenly piping and tooting. The observation hive fogged up with all the intermittent downpours and the queen was elusive, as usual. ‘J’ ran the booth quite well while I wandered off to feel real human lungs and hearts with mechanical valves (“you should put gloves on, it sets a bad example for the children,” oops) and best of all we were next to the Seattle Aquarium folks, with baleen, illegal furs and otter skulls. What a wonderful day! It’s one thing to read that a bee takes a lifetime to gather enough nectar for one tenth of a teaspoon of honey. But when that worker bee is in front of your face, and a tenth of a teaspoon is on your tasting stick, then the immensities of scale and wonder meet. This is a small part of why I volunteer and work for PSBA as an Officer and apiary manager. I set aside time to spend with my friend Elaina and talk bees with excited young people. I met a young woman who is smart and funny and disciplined with her studies. I’ve learned design skills, information presentation and event organization from Krista Conner. PSBA gives me the venue and support to pursue the native and non-native pollinator education projects that I value. Every time I teach, I learn something new about how people perceive honey bees and native pollinators. And where else could you feel a polar bear skin with one hand and feel the hum of a hive with the other?